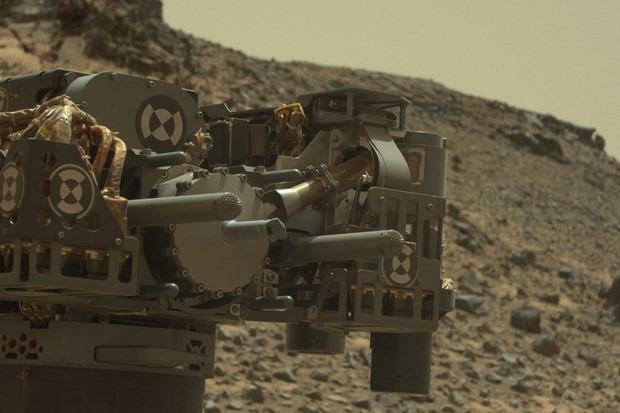 The Mars rover Curiosity is sitting stationary – all work paused – as NASA engineers try to figure out what caused a short circuit on its robotic arm. NASA is hoping to get the arm operating again in a few days, but engineers are still searching for the cause of the problem, said NASA spokesman Guy Webster. “I’m not sure where the short is, but we’ve been doing some testing,” Webster told Computerworld. NASA initially reported on Tuesday that an onboard fault-protection action had stopped the robotic rover from working on February 27 while it was in the process of transferring sample materials from a device on the rover's robotic arm to onboard laboratory instruments. At the time, Curiosity, which is looking for evidence that Mars once could have supported life, sent information back to NASA indicating it had sustained a transient short circuit. Engineers immediately began diagnostic work. "We are running tests on the vehicle in its present configuration before we move the arm or drive," said Curiosity Project Manager Jim Erickson, of NASA's Jet Propulsion Laboratory, in a statement. "This gives us the best opportunity to determine where the short is." This is not the first long-distance software fix for Curiosity. In November 2013, the rover was knocked into safe mode when a problem occurred shortly after the rover received a software upgrade. Curiosity has been working at the base of Mount Sharp, which has been the rover’s destination since it landed on Mars in August 2012. The rover first explored the area around its landing site, where it found evidence of an ancient river flow and lake beds. In 2013, Curiosity began a six-mile journey to Mount Sharp, where scientists are hoping to get information about different eras of Mars’ history by examining the various layers of the mountain’s geology. When the short circuit occurred late last month, the robotic rover was in the process of transferring rock powder, which it collected after drilling a rock named Telegraph Peak, from an instrument in its arm to laboratory instruments inside the rover. Telegraph Peak is a rocky outcrop the rover has been studying for the past five months.